President Bush arrived in Chile last week for the Asia-Pacific Economic Cooperation Summit in the midst of protest. Signs were held up in the crowds numbered in the tens of thousands: "Bush, you stink," and "Terrorist Bush," as chants broke out: "Bush, listen: Chile is not for sale!" and "Bush, fascist, thief, murderer!" Police of course were present and doused the "unruly mob" with water cannons, in attempts to control and disperse the protesters. Bush's recent reelection along with the protest on the streets of Santiago are reminiscent of a titanic struggle between left and right that took place in Chile between 1970 and 1990. Every American remembers (or is constantly reminded of) the events of September 11th 2001, but few recall the events in Santiago de Chile on September 11th, 1973. On that day, Salvador Allende, the "democratically" elected Marxist president of Chile, was overthrown by a military coup. In 1970, Chileans went to the polls and handed a narrow victory to Allende, who garnered 36.29%, besting his nearest opponent by a mere 1/2 percent of the vote (no lawyers, no recount). Mr. Allende interpreted this victory as a mandate (sound familiar?) and set out to destroy his country by implementing Marxist economic measures. He "nationalized" (the PC term for stealing with a barrel of a gun) industries and banks, while inviting his friend Fidel Castro, who really knows how to run an economy (into the ground), to spend a month in Chile. By 1973, the 64 percent of Chileans who were not part of Allende's "mandate" were becoming extremely impatient with his Marxist economic disaster. Sensing the dissatisfaction with his rule, Allende did what any good aspiring dictator would do, he armed his supporters and sought to make strong alliances with elements within the nation's military. Unfortunately for him, others in the Chilean military suspected that he was plotting against them, and they staged a successful coup. While the presidential palace was being bombed, Allende the consummate politician found time to make radio speeches, full of the usually empty political campaign rhetoric. Allende was allegedly found dead. He had shot himself with a machine gun, it seems that he was not just a terrible president, but a lousy shot too. General Augusto Pinochet emerged as leader of the military junta that took power after the coup. Milton Freidman and the "Chicago Boys" were invited to help implement new economic policies in Chile (marked improvement compared to Fidel Castro). Taxes on wealth and profit were eliminated, as was the minimum wage. The country's pension program (AKA Social Security) was privatized, as were the previously "nationalized" banking and copper industries. But despite the liberal policies implemented in the field of economics, individual rights suffered greatly under General Pinochet's rule. The "Chilean Miracle," as the economic turnaround is described, was accompanied by some twisted magic tricks (disappearing acts.) Over three thousand Chileans were murdered or just simply "disappeared" during military rule in Chile. Torture and arrest of civilians without the benefit of due process was rampant. 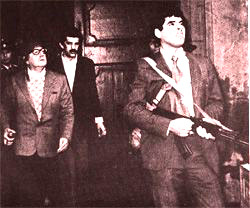 In 1989, after losing a plebiscite with only about 30% support for his rule (almost a mandate in Allende's book), the "good" general decided to step down and relinquish "some" of his power. Chile's democratic heritage was returned and the masses went back to electing candidates who promised lots of freebies (at someone else's expense, of course). Struggles similar to the one in Chile between 1970 and 1990 have been played out throughout human history. Every US election brings us two unpalatable choices, yet people still waste a perfectly good hour (or two) casting a vote for what they perceive as a lesser evil. You can have the Patriot Act with a side of lower taxes, higher debt and a needless war in Iraq for dessert, or the Patriot Act with a side of higher taxes, more social spending and a needless war in Iraq for dessert (low carb, of course). Is this the best humanity has to offer? A powerful leviathan than can take your money and/or your life. Is man capable of individual rule, or does he fear and loath self reliance to the point that it too must be rammed down his throat with a barrel of a gun (much like "democracy" in Iraq)? Does right make might? Apparently not. Might may not make right, but it does go a long way in procuring power. As sociopathic Nietchzean Supermen (like Allende and Pinochet or Bush and Kerry)) lead the battle between "left" and "right" for power over a complacent mankind, freedom, individual rights and common sense lay on the earth asphyxiated and moribund.